Tai Chi Maine Treasurer Gail Nixon presents this year's Tai Chi Maine contribution of $1,585 for Bridgton Recreation Department kids programs to the department's director, Gary Colello. Spring is busting out all over and everything seems to be new again, including the writer of this Inside Bridgton section of the Lakes Region Weekly. My name is Perri Black, and I have taken over from Julia Marino as she moves on to other things. I look forward to keeping you updated about what’s going on in Bridgton, and I appreciate any information about events and happenings that you would like me to include in the column. Please contact me at perrilb@gmail.com. The Bridgton Chamber of Commerce will hold its Annual Charity Auction on Thursday, May 19, at Bridgton Academy, 11 Academy Lane. Proceeds will benefit Harvest Hills Animal Shelter and Camp Sunshine as well as the Greater Bridgton Lakes Region Chamber of Commerce. Bring your checkbook and be there when the doors open at 6 p.m. to enjoy hors d’oeuvres, sample beer and wine, and listen to music by Toby McAllister, all while placing bids on items in the silent auction. The action will really pick up during the live auction, which begins at 7:15 p.m. Among the many items local businesses have generously donated are $1,500 towards braces from Dr. Burton Rankie of White Mountain Orthodontics in Naples; a 2017 Season Pass to Shawnee Peak; a $125 gift certificate for chimney sweeping donated by Dirty Bristles Chimney Sweep; and a $100 Gift Certificate to the Stone Mountain Art Center in Brownfield. Auction tickets are $22.00 at the BCC office or $23 online at http://mainelakeschamber.com (click on the Hot News! tab). Don’t miss out on the fun and the chance to grab yourself some great deals! Tai Chi Maine begins its fourth year under the sponsorship of the Bridgton Recreation Department, holding free weekly classes on Tuesdays, Thursdays and Fridays at the Old Town Hall on North High Street. 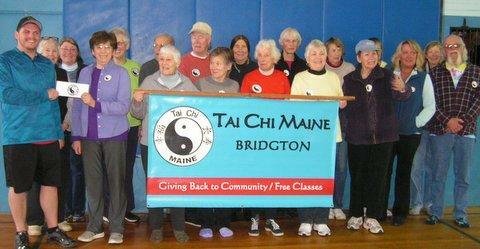 Tai Chi Maine is grateful to the Rec Department and the town for the use of the building. The group always tries to give back to the community – this year it contributed $1,585 to support the Rec Department’s programs for kids. Tai Chi Maine is one of many adult programs involving people from a number of towns in the “Greater Bridgton Community” and it is happy to help maintain these valuable community assets that are available to everyone. For more information about Tai Chi Maine and its free classes, go to www.taichiinmaine.com or call the administrator, Fritz von Ulmer, at 452-2239. Come to the Bridgton Community Center on Wednesday, May 18, from 2:30-4 p.m. for the University of Maine Cooperative Extension Gardening Series talk, “Get the Garden Ready,” and learn how to prepare your plot for a fruitful harvest this summer. The Community Center is located at 15 Depot St., behind Reny’s. More information can be obtained by calling 647-3116. Pack your binoculars, put on your bug dope and join botany enthusiast Ursula Duve and naturalist Mary Jewett for a trail walk in Holt Pond Reserve Friday, May 20, at 9 a.m. Learn about local wildflowers and woodland plants along the way and observe migrating birds while enjoying a day out in this beautiful nature preserve. This walk is part of the Lakes Environmental Association’s Caplan Family Environmental Education Series and is free to LEA members, $5 for non-members. For more information and to sign up for the walk, contact Mary Jewett at 647-8580 or mary@leamaine.org. To learn more about the LEA and its activities go to their website: mainelakes.org. ‘Tis the season when flowers are blooming in their glory. The Loon Echo Land Trust will conduct its Spring Wildflower Walk beginning at 8 a.m. Saturday, May 14. Jon Evans, Loon Echo stewardship manager, will lead the walk, which follows the Southwest Ridge Trail on Pleasant Mountain. Discover how to identify native wildflowers, such as trilliums, Canada Mayflowers and wild columbine, and learn about the history of Pleasant Mountain. Meet the Loon Echo staff at the Southwest Ridge Trailhead on the west side of the mountain off Wilton Warren and Denmark roads. The weather this time of year can be fickle so come prepared – wear sturdy walking boots or shoes and warm, waterproof clothing. Don’t forget to bring trail snacks, water and bug repellant because springtime is also blackfly time! The appearance of the Bridgton Farmers’ Market, featuring a wide range of local food and other products, is a sure sign that summer is not far away. The market opened May 7 with three new vendors, bringing the total number of sellers to 17. Check out the amazing variety produced by farms in our area including lamb, beef, eggs, seasonal vegetables and fruits, mushrooms and, my favorite, garlic scapes. There are also vendors offering homemade soap, bread, pies and jams and jellies. For the first time, EBT cards will be accepted to purchase eligible food items at the market. EBT shoppers can also earn “Harvest Bucks” to buy fruits and vegetables and help them stretch their food dollars even further. The market, located next to the Bridgton Community Center on Depot Street behind Reny’s, is open 8 a.m.-1 p.m. every Saturday all summer long. While you’re there, check out the new bottle-cap murals that brighten the side of the community center. Tai Chi Maine Treasurer Gail Nixon presents this year’s Tai Chi Maine contribution of $1,585 for Bridgton Recreation Department kids programs to the department’s director, Gary Colello.